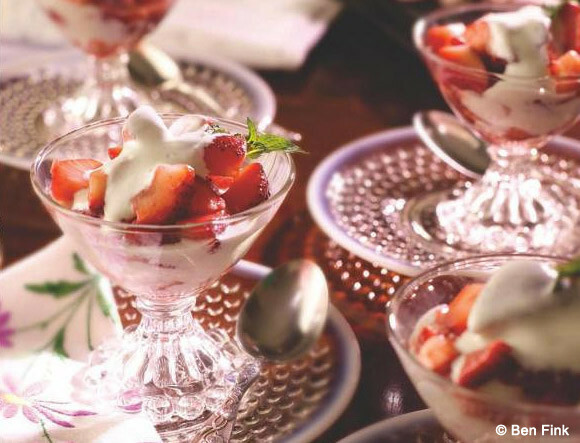 Mine (and Jackie Kennedy’s) favorite summer strawberry dessert! A 1960s classic that should never have gone out of style. I discovered (and fell hard for) Strawberries Romanoff when researching my cookbook about the Sixties. It’s believed to have been created by the chef of Russian tsar Nicholas I from the Romanov House, but was made popular in the 1960s when it was served at a star-studded White House lunch. It’s light, refreshing, and incredibly simple to make. When Princess Grace lunched with Jackie at the White House, chef René Verdon ended the meal with this sumptuous strawberry dessert. Re-create your own royal treat by serving with small, local strawberries if possible. And while Chef Verdon used candied violets to garnish his dessert, you can also use fresh unsprayed violets or Johnny-jump-ups from your summer garden (as long as they haven’t been treated by pesticides). Another tip: freeze the serving bowls, as this will melt fairly quickly, especially in warm weather. 1. Toss the strawberries with the orange liqueur or juice in a bowl, cover with plastic wrap, and refrigerate for 30 minutes to 2 hours. 2. Just before serving, whip the cream, confectioners’ sugar, and vanilla in a chilled medium bowl until stiff. Mash the ice cream in another medium bowl with a rubber spatula. Stir about one-quarter of the whipped cream into the ice cream, then fold in the remainder. 3. Divide half of the strawberries with their juices among 4 chilled glass serving bowls. Top with half of the whipped cream mixture. Repeat with the remaining ingredients. Garnish with the mint leaves and serve immediately. The perfect summer dessert! I love Strawberries Romanoff! These look wonderful! My mouth is watering! I remember many, many ( I was seventeen ) years ago, still in my parent’s home, cooking something similar ( for sure you know st. honore ) and it was very good. Begginer’s luck for sure. Since then, I’ve never tried again.For sure I’ll use your recipe for my son and daughter.Miguel, specially has a sweet tooth.